A sci-fi shooter that takes place on a mysterious alien ring-world, Halo will have you battling through amazing indoor and outdoor environments, in vehicles, and on foot with the largest arsenal of futuristic weapons, vehicles, and combat roles of any shooter ever. In a desperate attempt to keep a conquering alien race called the Covenant from finding Earth, you flee to a distant uncharted system where you unexpectedly stumble across Halo, an enormous alien artefact in orbit between a gas giant and its moon. Your objective: Uncover Halo's horrible secret, and destroy mankind's nemesis - the Covenant. Huge weapon variety: Vanquish your enemies with a vast array of Human or Covenant weaponry ranging from the stealthy (semi-automatic pistols, alien plasma swords) to the fierce (rocket launchers and flame throwers). Vehicle & foot-based action: Tackle missions anyway you choose--be it storming an enemy base or taking the wheel or gunnery position of a variety of powerful vehicles. Vehicles range from stolen Covenant flyers & hovercraft to Human buggies, tanks and more. Indoor & outdoor combat: Fight seamlessly in Halo's ultra-realistic indoor and outdoor environments as you hunt the Covenant in dozens of single player missions and multiplayer battles. Intense multiplayer shoot-outs: Form a team, choose a role, and fight cooperatively with your friends, battle it out Deathmatch style via intense split screen combat or fight co-op with a friend through the single player missions. 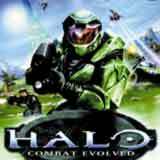 Incredible mission variety: Fight the Covenant in dozens of missions as you uncover the dark secrets of Halo. Among your many objectives - attack enemy outposts, raid underground labs for advanced technology, rescue fallen comrades, steal alien vehicles and weaponry and snipe enemy forces. Reality-bending special effects: Halo features the most advanced graphic system on the most advanced gaming platform in the world. Gunfire rips off the screen, explosions light up a living room, and environments blur the line between your couch and fantasy. Rich sci-fi experience: Halo transports gamers into a science fiction universe fresh out of a Hollywood movie. With a detailed twisting story-line, complex characters and cunning enemies Halo will fulfill every sci-fi enthusiasts dream.